A Gilding Flakes Tutorial to show you how to get this look to your cards and give them the luxury look. It is another idea that can make your cards stand out from the crowd. There are a lot of different ways to use them and this is just one technique you may like to try for yourself. 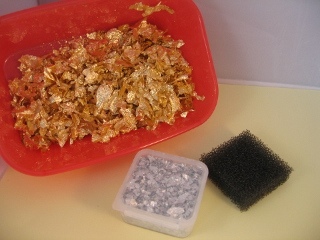 When you buy your flakes they will come to you in small pots and they come in many different colour mixtures. 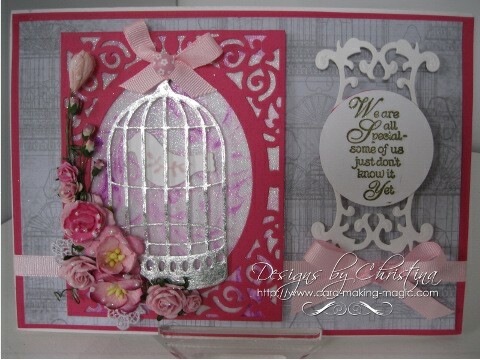 This card has pure silver flakes added to the birdcage. But there are gold and copper as well as mixtures with elaborate names to them ... but they all add that little touch of luxury to any card that you make. They have many products on their website that you may like to browse and many lovely mixes of flakes. Leave them at room temperature for a little while and then when they get warm they will swell and give you twice as many as you thought you had. 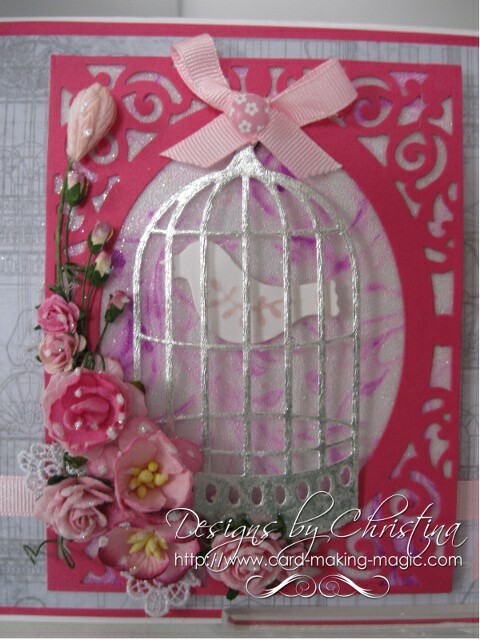 Here is the close up of the card that is created in the video so that you can see the effect. I have used a double sided adhesive sheet ... which you can also buy from Indigo Blu ... to make the flakes stick. But over the next few videos I hope to show you other ways to use them too. They are an inexpensive addition to your crafting "Stash" and one that you will be so pleased that you have bought. And the Gilding Flakes Tutorial will take you step by step on how to use the sheet with the flakes to get this lovely effect.